A new Sentinel for Touken Ranbu Decks is revealed (specifically focused on the new Hanamaru variant). AUTO: [Choose 1 card from your hand, Discard it] When this is placed on (GC) from the hand, you can pay the cost. If you pay it, choose 1 of your Units being attacked, during that battle, it cannot be hit. If you have 4 or more “Hanamaru” Rear-guards, CC1/SC1. For Today’s Card, we’re introducing from “Touken Ranbu -Hanamaru- Deck Set 2” (on sale October 6th), is the 【Sentinel】 “Namazuwa Toushirou -Hanamaru-“. “Namazuwa Toushirou -Hanamaru-” is a Unit with the ability the anime and other related material call “Perfect Guard”, which means when it’s placed on the Guardian Circle, you can discard 1 card from your hand to completely defend against your opponent’s attack. 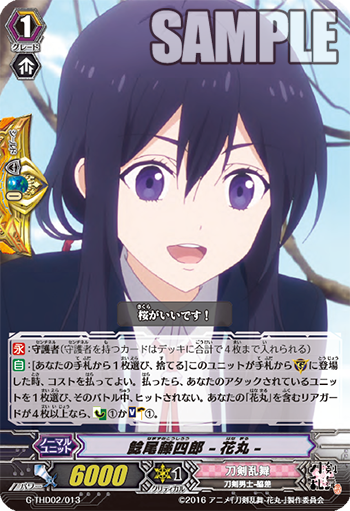 And in addition to have this 【Sentinel】 ability, if you have 4 or more “Hanamaru” Rear-guards face-up on the field, you can Counter Charge 1 card and Soul Charge 1 card. Since it doesn’t refer to the Drop Zone, it’s very handy to use early on if you bring out a bunch of Rear-guards. So let’s recover the costs depending on the situation. We’ll be introducing more cards from “Touken Ranbu -Hanamaru- Deck Set 1/2” in future “Today’s Card”! Look forward to future updates!